The leader of Syria's Al-Nusra Front threatens attacks against Hezbollah in Lebanon. The leader of Syria's Al-Qaeda rebel wing, the Al-Nusra Front, threatened attacks against the Shiite Hezbollah in Lebanon in the coming days, Reuters reported on Tuesday. Hezbollah's involvement alongside President Bashar Al-Assad in Syria has stirred tensions in Lebanon. Hezbollah's fighters clashed with jihadists in eastern Lebanon in October, and its strongholds have come under repeated bomb attacks over its involvement in the Syrian conflict. Hezbollah leader Hassan Nasrallah said earlier on Tuesday that it was determined to battle hardline Sunni Muslim insurgents who have seized large areas of Syria and Iraq and forecast they would be defeated across the region. In response, Al-Nusra Front leader Abu Mohamad al-Golani said in an interview with the group's media outlet, "The real war in Lebanon is yet to begin and what is coming is (so) bitter that Hassan Nasrallah will bite his fingers in remorse for what he has done to Sunnis." It was not clear when the interview was recorded, noted Reuters. Last month, Hezbollah lost 10 of its fighters in a battle in eastern Lebanon with Al-Nusra Front militants. Golani said in the audio message on media outlet al-Manara al-Baydaa, "After Hezbollah assaulted our people, we were forced to move the battle inside Lebanon and to areas where it is present...so that it understands the danger of standing as an ally to Assad." Al-Nusra also joined an incursion into the Lebanese border town of Arsal in August and its fighters captured several Lebanese soldiers when they pulled out. They have shot dead one of them. Golani also praised the leader of the Al-Nusra cell that took part in the Arsal operation, Abu Malek al-Shami, saying his acts have had "positive results," according to Reuters. 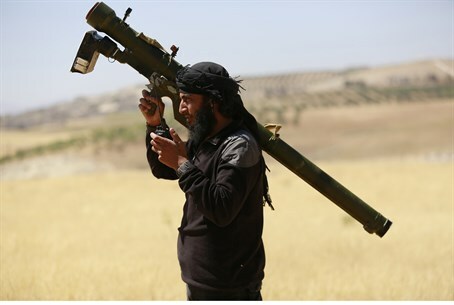 Al-Nusra Front was once one of the strongest insurgent groups fighting to topple Assad but has been overshadowed by the Islamic State (ISIS), which has seized swathes of northern and eastern Syria and is now being targeted by U.S.-led air strikes. The United States plans to expand military support to moderate opposition anti-Assad groups as part of its strategy to defeat the ultra-radical Islamic State. Golani said his fighters and other Islamist groups intended to eliminate the Western- and Saudi-backed Syria Revolutionaries' Front (SRF), accusing it of carrying out attacks on Nusra and civilians in Syria's Idlib province. "They (SRF) have transformed from a group fighting the regime to a group assaulting our people, that is why eliminating it became a must," he said. "We fight whoever wants evil for our people in Sham (Syria) or tries to be a tool in the hand of the West to fight the Islamic project in the region."